Simply hand us your paper originals and we’ll prepare them for scanning. We’ll repair any damage, remove staples and fixings and capture all images to optimise their brightness and contrast. We’ll de-skew and de-speckle where necessary, standardise orientation and remove coloured backgrounds if required. 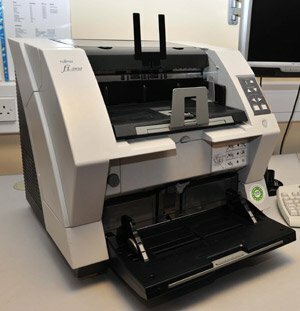 Our document scanning services are extensive and can support you with low or high volume digitisation of your business files. Offering a free consultation and options for OCR, security and supported digital formats we can assure you that our scanning department is perfect for your corporate and business needs. Established in 2007 we have been scanning and archiving leading companies files into all formats of digital media to external drives and cloud options. Contact us on 01865 457000 to discuss your project. Excellent testimonials from Oxfordshire County Council, PACE, B4 Business, Oxfordshire Soldiers Museum, Ashmolean Museum and many other archive companies.